Not Enough Actors? Say It Ain’t So! I went to the second night of auditions for Shattered Angel on Friday. Once again, that is a play about a local historical murder being presented by the Herkimer County Historical Society in cooperation with Ilion Little Theatre (or is it “in conjunction” or “under the auspices of”? I don’t know the details). As it turns out, we have a slight problem. Not enough actors showed up. The background was from a different play. There were enough folks there to read a couple of scenes. Unfortunately, even with doubling parts, I don’t think we got enough to cast the play. These guys read several time. One fellow read but thought he could not do the show, because of his work hours. Three weekends is a kind of a large commitment. I read this scene on Wednesday. I was just filling in, though, because there was nobody present who really qualified for the part I read, that of the young murderer (I didn’t need a spoiler alert for that; this is a murder play but not a murder mystery). I wanted to include one shot with the director, Stephen Wagner. He’s pretty cool. So, local readers, are any of you actors? Would you like to be in a play? Go to the Ilion Little Theatre Club Facebook page at https://www.facebook.com/ilionlittletheatre/. Send a message, write a post, call the theatre. Older male actors are primarily needed. Can anybody help us out? Posted in community theatre, humor, personal and tagged actors, auditions, herkimer county historical society, Ilion Little Theatre, Ilion NY, local historical murder, Shattered Angle, theatre. Bookmark the permalink. Earlier today I sat down in front of a notebook (paper, spiral bound, I need hardly say), because I knew it would be a good idea to write a blog post ahead of time and avoid sitting at the keyboard and typing off the top of my head, as I do all too many times. Nothing particularly inspired came out. I don’t know why I use the adverb, “particularly.” Nothing the least bit inspired came out. On the other hand, it is Mental Meanderings Monday. I’ll just let my mind meander a bit. If nothing any good comes out, oh well. Does anybody even read blogs on a Monday? Um, I just read one before starting this. I started reading another one, but it was too long. I’m on a time budget tonight. And WHY am I on a time budget, you may ask. Or you may not ask. You might not care OR you may have leaped to the logical conclusion that I was indeed cast in that play I auditioned for… was it only last Monday? Is it still jumping to a conclusion if it is logical? I think not. I think that is an oxymoron. That is unusual, because usually I am a regular kind of moron, so I will let it stand. For another reason, “leaping” and “logical” make an alliteration, which kind of hooks into last Monday’s post. Where was I? Ah yes, explaining that I must make this post quickly, because I have to go to auditions for Steel Magnolias at Ilion Little Theatre. Yes, I already attended auditions for Steel Magnolias at Ilion Little Theatre. They are having an extra day. Long story, not very interesting. I will let you know if I get cast. In the meantime, happy Monday. 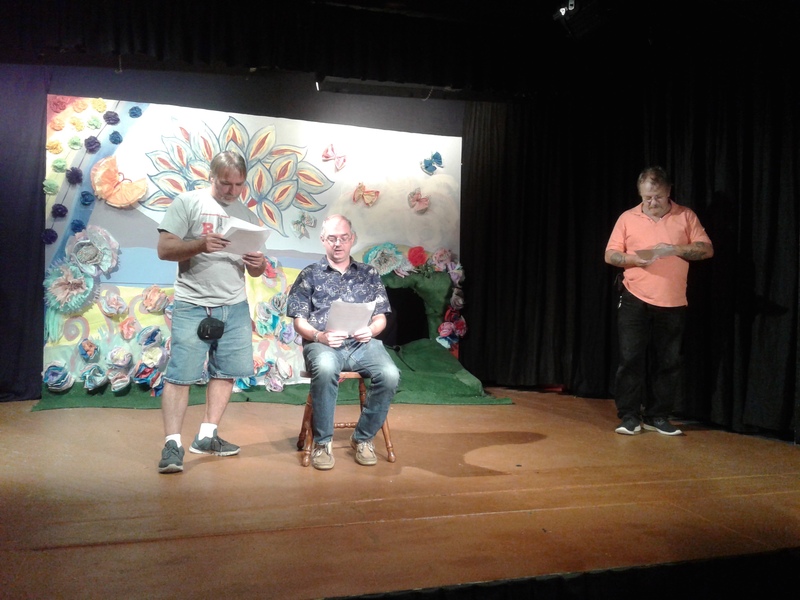 Posted in humor, Monday Mental Meanderings, personal and tagged auditions, blog post, blogging, Ilion Little Theatre, Steel Magnolias, theatre, writing. Bookmark the permalink. I Am NOT Going to Audition! The Little Theatre will hold auditions on Monday, August 29 at 6 p.m. for Splitting Issues (and Several Other Noteworthy Concerns). 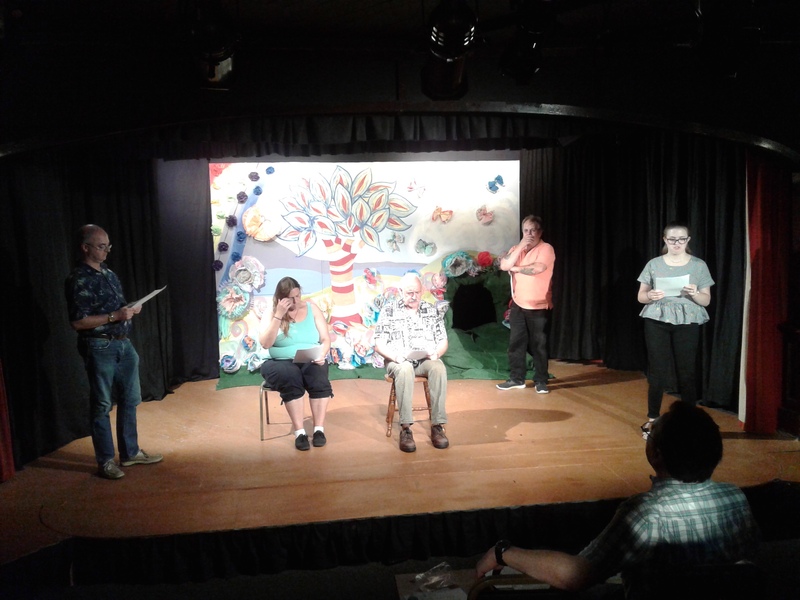 The show is made up of nine comedic sketches about relationships – some romantic, some new, some fraying, some ending, some beginning anew. There are multiple parts available for men and women with flexibility on ages. I do not intend to audition. My only purpose in going is to accompany my husband, who is a marvelous actor. He was last seen on stage in May in Leading Ladies, which was directed by me (I believe I wrote a blog post or two about it). I think it would be a delightful thing if he was to be on stage again. I plan to sit in the audience and applaud vigorously, perhaps adding in a “Bravo!” or “Huzzah!” I may also go to the cast party. I do love a good cast party. As for me, I am still involved with Much Ado About Nothing with LiFT. We have one final performance this Friday at the Herkimer Elks Lodge. I should perhaps write a blog post about that, for the benefit of any local readers who might like to attend. In the meantime, if any local readers see this post in time and are interested in auditioning for Splitting Issues, you can check out the Facebook event at https://www.facebook.com/events/329915084008641/. For more information on Ilion Little Theatre in general, their website is www.ilionlittletheatre.org. 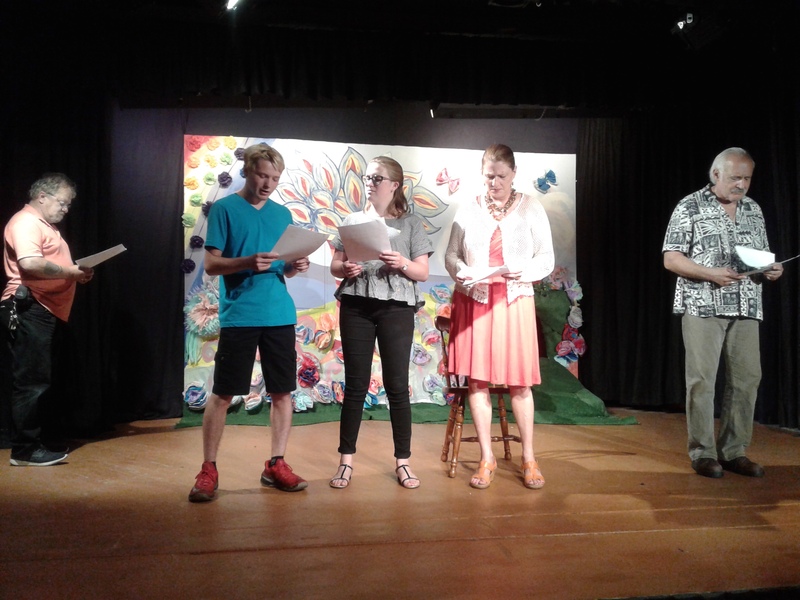 Posted in community theatre, humor, personal and tagged auditions, blog post, Ilion Little Theatre. Bookmark the permalink. This timeI think it really is Writer’s Block. I just sat here by my notebook for a good ten minutes and no thoughts came through my head and out my fingers. I was also eating my sammich and vegetables at the same time (although in general I am no fan of multi-tasking). I finished my lunch in short order, and as you can read, I’m writing now. Perhaps it isn’t any good, but it’s words on paper. Sometimes we must take what we can get. All morning as I worked (yes, when I COULD have been thinking about my blog post), I was obsessing about Leading Ladies, the show I am directing (should I say that every time and should I specify at Ilion Little Theatre? I don’t like to bore regular readers, but I must also consider those of you who are just tuning in) (if any) (um, I mean if any AT ALL, regular or otherwise). 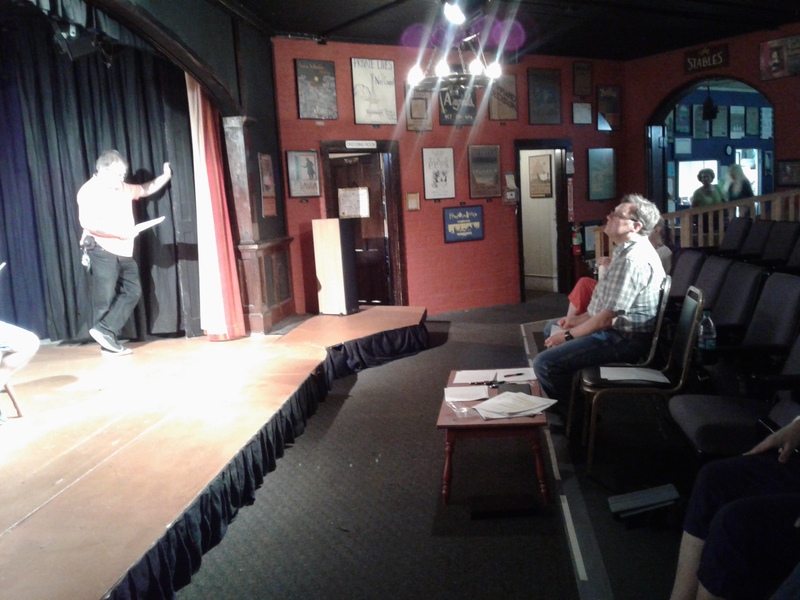 Thirteen people showed up for auditions Monday night. That is a marvelous turnout for our little community theatre. I only need eight actors! Oh dear, maybe this is not so marvelous after all. How can I turn people away? How can I decide who to turn away? Now what? I know, it is a great problem to have. Usually we are making phone calls, sending emails and tearing our hair out. So I’m not exactly complaining, although I suppose it sounds suspiciously like I am. Be that as it may, I have now blathered on for over 200 words. It is Tired Tuesday and I must get to the second night of auditions. Wouldn’t it be cool if even MORE people showed up? Maybe I need to find a bigger play. Posted in humor, personal, Tired Tuesday and tagged auditions, blog post, Ilion Little Theatre, Leading Ladies, not writing, Writers Block, writing. Bookmark the permalink. I was going to title today’s post “Manic Monday,” but then I thought about the song of that name and it didn’t really fit. Now I have the song playing in my head kind of mashed up with “She’s a Maniac” from Flashdance. I really should exercise more care in crafting these titles. I knew I would be pressed for time today, because auditions are tonight for Leading Ladies at Ilion Little Theatre (in case you forgot or never knew, that is the play I am directing). That being the case, it would have been a good idea for me to write my blog post earlier, maybe even to have written it and typed it in yesterday. Yeah, I’m likely to achieve that level of organization and planning at my age. In my defense, a co-worker nicely brought me a copy of Mohawk Valley Living magazine. I usually read that magazine cover to cover, not just my own article. It’s a really awesome publication. So I did not write my blog post, and I’m still not quite ready for auditions. I just now typed up audition sheets on my computer. For the uninitiated, the actors fill these out prior to auditioning, and I use them to write comments on. They ask name, contact information, availability. Sometimes they ask you to list experience, but I decided I didn’t really care. I mean, unless I’ve seen them in it, it doesn’t really tell me much. And if I saw them in it, I probably would remember it. I asked if they were willing to shave and wear a dress, since the two lead males have to do that. I was going to put “men only” for that question, but I didn’t like to discriminate. Longtime readers may remember how when I’m involved in a project this blog eventually becomes All [That Project] All The Time. I’m afraid I may get to the All Leading Ladies All The Time sooner than expected, unless I really get my act together. I think we all know the probability of that. Happy Monday, everybody. Posted in humor, Monday Mental Meanderings, personal and tagged auditions, blog post, blogging, Ilion Little Theatre, Leading Ladies. Bookmark the permalink. “Ilion Little Theatre will hold auditions for Ken Ludwig’s Leading Ladies on Monday and Tuesday, Feb. 29 and March 1 at 6:30 p.m. at the theatre in The Stables on Remington Avenue in Ilion. Five men and three women ranging in age from 20s to 70s are needed. Actors do not need to prepare anything. ILT member Cynthia Quackenbush will direct. “The hilarious comedy concerns two down on their luck Shakespearean actors who come up with a scheme to impersonate a rich old lady’s nephews to gain an inheritance. When they find out that nieces not nephews are required, they make a slight adjustment in plans. After all, in early Shakespearean companies, weren’t the women’s roles played by men? I confess to feeling a little overblown, calling it a hilarious comedy. It is pretty hilarious, though. I laughed out loud when I was reading the script. I confess further that it seems to me to be a pretty boring blog post. Sorry, kids, Aunt Cindy is having a bad day (I like to call myself “Aunt Cindy” when I am having a bad day). But I am trying to keep a cheerful heart. After all, tomorrow is Lame Post Friday. As always, I hope you’ll stay tuned. Posted in humor, Non Sequitur Thursday, personal and tagged auditions, blog post, Ilion Little Theatre, lame post, Leading Ladies, press release, theatre. Bookmark the permalink.